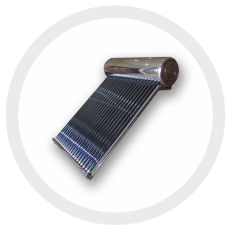 There are two main categories of solar water heaters: active and passive solar water heaters. Active systems use a pump to circulate a heat transfer fluid between a tank and a collector. On the other hand, passive systems do not use a pump which typically means that the collector and tank are in close proximity to one another. Both types of systems have their advantages and one of the advantages of active systems is freeze protection. They either use glycol anti-freeze or a drainback method to protect from freezing. However, this freeze protection comes at a cost, namely: a more expensive system that is complicated to install and maintain. They also require pumps (which consume electricity and contain moving parts that fail) and/or glycol which acidifies over time and can destroy the system from the inside. Passive systems can also be freeze protected, despite some common misconceptions. 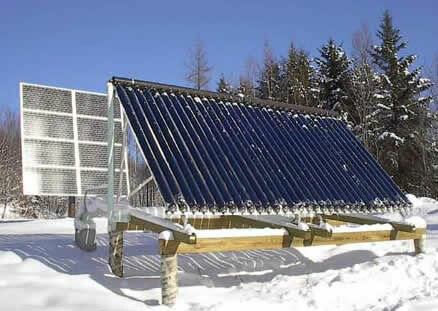 In climates that experience prolonged deep freezes, like Alaska or Minnesota, we recommend considering a drainback type system or using your passive solar water heater seasonally. But for most other areas, a Sunbank will work just fine. Sunbank has pioneered a freeze protection system that allows passive solar water heaters to be installed beyond their typically accepted ranges. The first thing to understand is that the Sunbank itself – the tanks and the collectors – are inherently freeze protected. The collectors are good to -35ºF and the tank which is well insulated and filled with 40 or 80 gallons of thermal mass, depending on your model, would have to be left for many days with no heat input nor flow in very cold weather to approach freezing. The part of the installation that is susceptible to freezing is the plumbing that goes to and from the Sunbank tank between the tank and the conditioned space. How Do I Freeze Protect? Minimize the pipe run between the tank and the conditioned space. For installations on a pitched roof this run will already be very short – on the order of 12″ – 18″. Use PEX piping instead of copper. In addition to being less expensive and more durable, it can also freeze without bursting. This is not something that you want to rely on but is a nice feature if the rest of your system fails. Insulate the PEX with the appropriate R-value of insulation based on your location. Wrap the insulation with a protective aluminum or PVC sheathing to protect is from UV radiation and to seal up air gaps. Install a freeze protection valve. This valve is a mechanical device that opens at 35ºF and closes at 40ºF allowing water to flow through the piping to keep it from freezing. It is installed on the hot return pipe just before it goes into the conditions space and is plumbed to drain. It is an SRCC approved freeze protection device and works even when the power is out. Optionally, you can also install the Watts Recirculation System. This system can be adapted to work on a button or motion sensor to give you instant hot water at the tap. It can be used with built in timer function to run for a few minutes during the middle of the night during the winter. This flow will heat up the insulation bundle to protect from freezing and minimize the use of the freeze protection valve. This thorough freeze protection system leaves you with the simplicity of a passive system and the assurance that you have a redundant system that will not leave you susceptible to freezing in moderate climates.